25 watt EarthBulb LED linear tube is available in 5000K with 300 degree beam angle. Provides greater than 45% energy savings. 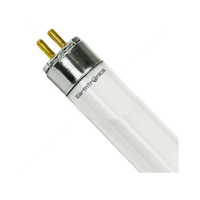 Great light output and perfect for replacement of T5 fluorescent tubes. This linear tube provides 3200 lumens and has a CRI of 82. This lamp is engineered for high lumen maintenance over its 50,000 hour rated life. Simply "plug and play" on electronic program start fluorescent ballasts.